UPDATE:We’ve updated this list for 2015. Find the latest version here. You’ve got to be in it to win it. And to win it in today’s market, you’ve got to be on mobile. Global successes such as Candy Crush Saga, Clash of Clans and Puzzle & Dragons have helped push gaming even further into the mainstream. To help you reach these lofty heights, Develop has assembled this all-star guide to app and mobile game development tools. Marmalade SDK is billed as the fastest way to build cross-platform C++ games. It enables you to open Xcode or Visual Studio projects and compile them for iOS, Android, Windows Phone, BlackBerry 10, Tizen, Mac and Windows desktops from a single Marmalade project file. In 2013, the firm launched two significant supplements to its flagship SDK, which it feels has helped to serve the needs of Marmalade users better. With Marmalade Juice, a cross-platform SDK for Objective-C, you can open your Objective-C code inside Marmalade, fine tune platform-specific features and then compile it for Android and beyond from a single Marmalade project file. And a little code goes a long way with Marmalade Quick, an acceleration tool with a fast, flexible and open environment. Quick is a Lua-based 2D RAD tool for cross-platform development, and was used to launch Marmalade’s first in-house game, Signal to the Stars, to four app stores at once. HTML5 is also catered for with Web Marmalade for speeding up web development with native performance. Marmalade SDK is priced from £379 ($500) per year (Indie licence), and comes with Marmalade C++, Marmalade Quick and Web Marmalade included for free. Marmalade Juice is available upon application. The powerhouse behind the ambitious Infinity Blade series offers two solutions for mobile game developers. Firstly, its full source Unreal Engine 3, which includes complete access to the integrated Unreal Editor suite, C++ source code and direct support from its engineering team. In addition, it provides the free edition of Unreal Engine 3, the Unreal Development Kit, which has had more than 2.25 million unique installs to date. Both products come with a set of industry-leading middleware packages and integrations at no additional cost. The elegant upgrade path from UDK to the full source UE3 is a particulaly good strength, allowing you room to grow and stretch your wings without having to learn new technologies. The vibrant Unreal Engine dev community also means that there are plenty of resources availble, whether you’re looking to have a question answered or seeking members for a virtual team. Epic provides additional information on its developer network and also produces video tutorials to teach you more about making mobile games with UDK on its Twitch TV and YouTube channels online. Unreal Engine 3 is available and priced upon application. UDK is free. Launched in August this year, Maya LT is Autodesk’s bid at opening its floodgates to mobile developers. Maya LT has been designed from the beginning specifically for the needs of start-up and mobile developers. Autodesk tell us that the product went through extensive testing and everything from its feature set down to its UI has been optimised to meet the unique needs of the mobile community. With Maya LT on Mac or PC, artists can use the Nex toolset, alongside essential animation features, such as keyframing and rigging tools via Autodesk HumanIK rig and skeleton generation. The product also has advanced material creation and the Turtle tool for texture baking and simulating realistic lighting as well as ShaderFX, a node-based shader editor. Furthermore, Maya LT supports Unity, Unreal Engine and CryEngine. An SDK for Autodesk’s FBX file format is available to let devs adapt environments to the FBX format. Before the launch of this new package, Autodesk released its Scaleform Mobile SDK and Unity plug-in for iOS, Android and Windows Phone last year. The former enables developers to use the SDK as a standalone Flash runtime to port games to mobile platforms, while the plug-in brings Autodesk’s popular UI tools to Unity developers. Autodesk Maya LT £700, Autodesk Scaleform Mobile SDK/Unity (plug-in) £195. From 2D puzzle games to complex 3D action titles, Unity continues to be a favourite among developers for its accessibility, dependability and cross-platform capabilities. For mobile, Unity’s integrated development environment allows developers to port between all major mobile platforms, and soon Tizen and PlayStation Mobile. Games can also be ported to the web (via Unity Web Player), PC, Mac, Linux and all major consoles, including PS Vita with relative ease, giving you greater potential to reach the widest audience possible. The fundamental Unity tools are available for free and you can currently use those free tools to publishing games to iOS, Android, BlackBerry 10 and Windows Store for no cost, collection fee or royalties. However, once you or your company starts to bring in revenues over $100k a year, Unity asks that you upgrade your licences to Unity Pro. The professional version includes extra features designed to add extra value for high-end production, including more advanced lighting, code and editing options. And Unity’s own asset store also means further time and cost-savings can be made. Unity 4 is free, Unity Pro (plus optional iOS, Android, BlackBerry add-ons) priced from £965 approx’ ($750). 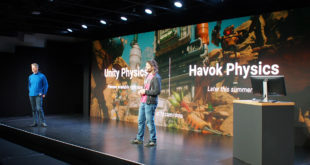 Havok, the outfit best known for its physics tool, made a splash back in March with the announcement of Project Anarchy, its first specially made package for mobile game developers. This end-to-end mobile games engine allows you to ship games for free on iOS, Android and Tizen. Incorporating Havok’s Vision Engine, Physics, Animation Studio and AI products, Project Anarchy is packed with features such as an efficient asset management system, LUA scripting and debugging and a full library of sample materials, tutorials and videos to help make development faster and more efficient. The mature feature set should give those familiar with the software much comfort. Project Anarchy is free, Project Anarchy Pro pricing is available upon contact. The big boys aren’t all that’s available for mobile devs these days. For those in search of formable development alternatives, App Game Kit is a worthy solution. Games and apps can be built in BASIC or C++, making the tool ideal for beginners or professional developers. And there’s no need to worry about the complexities of bringing your game to the different mobile platforms it supports, as its creators have built the engine to take care of such tasks. AGK also aims to make testing on mobile devices easier. With its compile and broadcast feature in the BASIC environment you can transmit your games to any of your devices. Version one is available now and supports iOS, Android, and BlackBerry. Meanwhile, version two is well underway, following a successful crowdfunding round. App Game Kit priced from £40 ($60). Developing mobile apps that run on all key devices is getting harder, and there is an increasing need to diversify and publish cross-platform content. Corona SDK aims to offer the ability to seamlessly publish apps across multiple platforms with a single code base, giving developers room to focus on creating engaging, high quality games. Corona SDK is free, Corona SDK Pro £368 ($588), Corona Enterprise from £594 ($948). Its maker claims Ludei offers the fastest HTML5 gaming experience around, while its CocoonJS Launcher App and Cloud compiler is said to simplify the process of testing and building the final applications to upload to the markets. Along with this, Ludei also gives you access to important native features, such as native ad networks, in-app payments and push notifications, through a single API. Launched in August 2013, Nextpeer is a multiplayer social SDK for mobile games that aims to enable you to easily create multiplayer games, as well as increase retention and engagement for your games. It is said to take less than 15 minutes to integrate with the SDK, and some 2,800 games are already integrated with the Nextpeer SDK on iOS. PlayHaven offers a selection of tools targeted at helping you manage player acquisition, engagement, and monetisation, on iOS and Android, plus Unity, Adobe AIR, Marmalade and Corona via plug-ins. Flagship tool, Acquire is intended to help you pick up new users through PlayHaven’s ad network. Engage helps you learn more about your users, build loyalty, improve communication and re-engage after they’ve left the app. Finally, Monetize is intended to help grow revenue by creating and deploying in-app purchases and relevant ads to targeted users. Recently, the firm announced a partnership with Corona Labs, integrating it services with the mobile SDK. PlayHaven Acquire, PlayHaven Engage and PlayHaven Monetize are free, but additional costs exist for advertising and other services. Players expect to be able to fire up their mobile games, and pick up right where they left off without a moments pause. Imagination’s PowerVR Graphics SDK aims to help you achieve the lightning-fast performance that today’s players demand. A cross-platform toolkit for iOS, Android and BlackBerry designed to support all aspects of 3D graphics development, the tech is used in over a billion devices today. PowerVR Graphics SDK is free. The firm behind several microprocessors that power today’s pocket-sized computers, also offers a selection of software development tools to ensure that you are able to extract every ounce of performance from the ARM Mali platform, understand graphical issues and play around with its leading-edge technologies early. ARM offers its OpenGL ES Emulator that supports new APIs (OpenGL ES 3.0) and tech (ASTC texture compression) to ensure you can begin working on these technologies and reduce time-to-market for your gaming content. Furthermore, its Mali GPUs are found in 20 per cent of Android smartphones and 50 per cent of Android tablets. ARM Mali GPU Software Development Tools are free. A heavy lifter when it comes to lighting, Geomerics’ chief tool has been ported to mobile in the last two years. The rapid improvements of mobile devices have brought console-quality techniques to mobile and Enlighten is a particularly compelling offering, with its ability to scale naturally to a platform’s capabilities, be it iOS, Android or PS Vita. The tool supports all lighting styles, from fully dynamic to totally baked, and can mix and match these throughout the game. Its workflow has also been designed with time-saving in mind, making it easier to build for mobile. Enlighten prices are available upon contact or request. Wwise is one of the leading audio tools for console development. Audiokinetic believes that mobile developers require the same productivity and quality as the big dev houses, which why it grants them access to the full package, instead of a striped down version, for an affordable licensing price. The smaller your budget, the cheaper Wwise gets. And better yet, Wwise is free to use for non-commercial and academic games. Audiokinetic aims to empower sound designers and audio programmers with a comprehensive authoring tool for creating exceptional game experiences. The tool is compatible with Android, iOS, Windows Phone, Nintendo 3DS and PS Vita. Hundreds of titles have used the toolset, including Limbo, Plants vs Zombies 2 and Solitaire Blitz. Wwise is available at a variety of licensing prices, and free for non-commercial use. Its ability to manage not just source code, but all the different media assets involved in modern game development, including art, textures, audio and video, has made Perforce a prized technology in games dev. To give you an idea of its versatility, 22Cans recently used the technology in the creation of its mobile title, Godus. Perforce Enterprise Version Management starts from £187 ($300).